MANCHESTER, NEW HAMPSHIRE—At a speech in New Hampshire Thursday night, GOP strategist Steve Bannon compared the accusations against Alabama Senate candidate Roy Moore to the release of President Trump's infamous "Access Hollywood" video during the 2016 election. "But it's interesting," Bannon told the audience. "The Bezos-Amazon-Washington Post that dropped that dime on Donald Trump, is the same Bezos-Amazon-Washington Post that dropped the dime this afternoon on Judge Roy Moore. Now is that a coincidence? That's what I mean when I say opposition party, right? It's purely part of the apparatus of the Democratic Party. They don't make any bones about it. By the way, I don't mind it. I'll call them out every day." Bannon called out the media saying, "it's not a free and fair media anymore." "You know, I run Breitbart, we're kind of an advocacy group in our own way, in the way we present grassroots and present working class people and economic nationalism, we're not shy about it," Bannon said. "Guys come to me for jobs and I say I'm not looking to hire people who want to win Pulitzers, I'm looking for people who want to be Pulitzer. Right? So I don't mind it, but I think it's a strange coincidence." 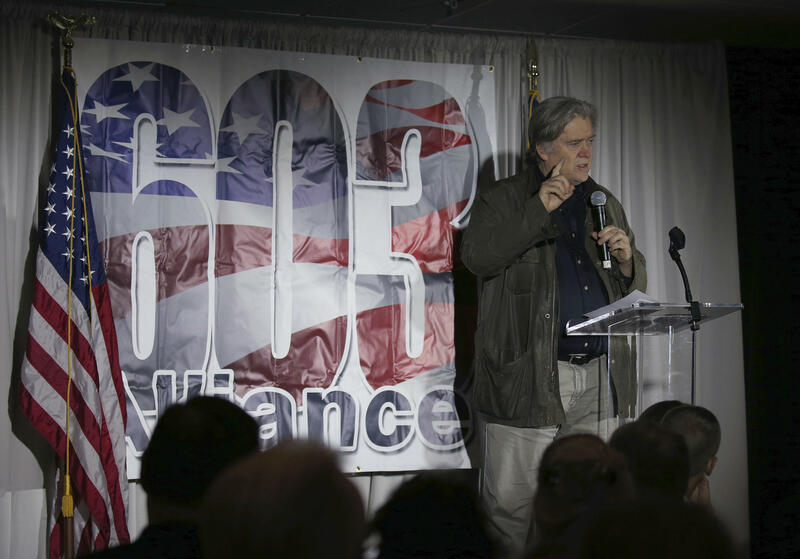 Bannon called it the accusations "politics of self-destruction," as he headlined the 603 Alliance's "Taking On The Establishment" fundraiser benefiting candidates running for the statehouse. Bannon's defense — that the Washington Post report was an orchestrated political attack — echoed Moore's campaign statement calling the Washington Post report the "very definition of fake news and intentional defamation." The Washington Post report, which CBS News has confirmed, disclosed that not only did their reporters speak with more than 30 people who knew Moore between 1977 and 1982, but also that none of the women accusers in the story sought out the Post. "All were initially reluctant to speak publicly but chose to do so after multiple interviews, saying that they thought it was important for people to know about their interactions with Moore," the Washington Post report says. Bannon backed the insurgent conservative who made headlines for his far-right beliefs – Moore has said that homosexuality should be illegal and that Muslims should be banned from serving in Congress — over sitting Senator Luther Strange, who was endorsed by Mr. Trump. In a radio appearance after Moore's primary win over Strange in September, Bannon sought credit for Moore's victory, bragging that he was "6-0" with special election candidates. He mocked the President for being "5-1." "Do not get on the wrong side of the football of your base. Listen to the people, please," Bannon added on Sirius XM's "Breitbart News Daily." On Thursday, Bannon also went into some of the backstory of what happened in the Trump campaign when the "Access Hollywood" tape broke, describing how Mr. Trump "blew up," and Bannon said it was time to "double down." "But when Billy Bush Saturday, we got you know kind of the high command and the war council and everybody went around the room, and Trump once again is asking for percentages," Bannon said. "I think the highest percentage was 40 percent. Right? They were telling him some guy's gotta go on 60 Minutes and cry on Ivanka's shoulder, and other people do this and do that and apologize, and apologize, apologize. He came to me and said what's the chance? I said 100 percent." Bannon then laughed and continued "he goes don't look at me, and I said 100 percent. And he said I don't want to hear it now. I mean he really blew up, he was not happy. And I said no, I mean it, right? They don't care about this, they don't care about locker room talk. They care about their country, right? I said, we double down now, right? You're Donald Trump and they're not, right?" Bannon's speech Thursday comes after he reminisced about Mr. Trump's win on the one-year anniversary of the 2016 election, or as he calls it, "the high holy day of MAGA." Bannon — unprompted and before the Moore story broke — also mentioned the "Access Hollywood" tape then. "The people don't care about locker room talk,"Bannon said of the tape, adding that instead people care about the "destruction" of the greatest country on earth. Bannon, who left the White House this summer to return to Breitbart News, has pledged to wage war on the establishment GOP.